We’ve blogged about worship at Greenbelt quite a bit over the past few years – about how we’re not a worship and teaching conference, but rather a festival that is shot through with a devotional and spiritual commitment; about our no-splits view of things, which takes the sacred and the secular and frames them through one lens. We borrowed Barbara Brown Taylor’s phrase, An Altar in the World for one and we blogged about 11 alternative ways in which we worshipped in 2017 in another. So, in that spirit, what can you expect at Greenbelt this summer from our worship and spirituality programming? The Sacred Singers from St Martin in the Fields – with us to sing in the Colonnades up at the main House and also to lead a Sacred Space sung reflection in The Shelter. And of course, there will be the perennially popular Taizé service, inviting Greenbelters into the peace and praise of their simple and meditative chants. The Shelter is also where you’ll find feminist sessions each day curated by festival trustee and theology lecturer, Marika Rose. The Australian performance poet will be with us in residence across the weekend and will lead a reflective session in The Shelter as part of that. Of course, there will be a special communion service for all those identifying as LGBTi at the festival. Members of various L’Arche communities will be with us at Greenbelt and they’ll be involved in a session on the importance of storytelling in community in The Shelter. For all those who feel like they don’t really fit anywhere else, Greenbelt is a home from home. And, within that home, there’s a room called The Goth Eucharist that is waiting just for you; a space that has become something of a Greenbelt institution (in a good way). A communion service based on the writings of RS Thomas and led by Canon Mark Oakley and the jazz maestros of the King-Cave Project – a mass for our times. The Australian cartoonist and mystic will lead a session on spiritual formation. Young faith leaders from the UK’s different faith traditions leading sessions on the challenges and hopes they face in their faith traditions – asking for our prayers and support. Lovingly curated and hosted by green Greenbelters Steve Hollingshurt and Rachel Summers, The Grove is our outdoor gathering circle for hardy types of all ages who recognise heaven in ordinary, and eternity in a grain of sand. Expect Forest Church sessions, nature connection provocations, passionate pleas for a more ecologically-minded religious practice, explorations into the connections between the indigenous pagan rites of these islands and our more recent Christian faith overlay, plus lots of all-age activities, fun and nature crafting. 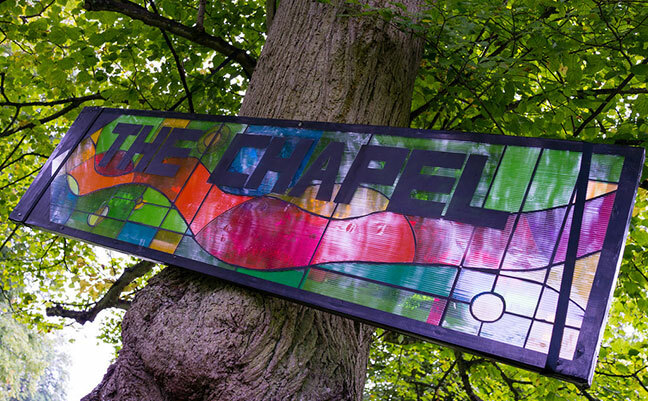 Curated and hosted for us by the wonderful folks from Space 2 Breathe (S2B) in Sheffield, the Chapel is your space for quiet, prayer and reflection over the weekend. Creating spaces that are welcoming and inclusive for those of all faiths and none, S2B are skilled in opening up opportunities for reflection in the midst of our busyness and outside of the more established and usual patterns of religious gathering. This year the Space to Breathe team will be offering a touch more support in and around the chapel venue, too. So if you’d value some form of gentle accompaniment from someone with just the right experience in guidance, then there will be people around. But equally, if you don’t want or need anyone – that’s totally fine! Space to Breathe will be helping us knit together spirituality and wellbeing in the festival setting. Since we’ve been at Boughton, the festival communion service has undergone a renaissance. Over the past three years, we’ve enjoyed services that have broadly focussed on inclusion – through the eyes of children, through the experience of those with additional access requirements, and last year through the lens of race. This year, we have something altogether more bizarre lined up. Basically, we’re planning to spend Christmas together. Complete with a tableau of characters (human and non-human) and special guest appearances, this will be a Greenbelt Communion Service like no other. And, if thinking about Christmas at Easter is weird, just think how much weirder it will be in August! It’s all incarnation to us. We’ve blogged a bit more about it here. This year we’re moving this Greenbelt institution to allow for more of you to get close to the heart of the action. Its new home will be The Canopy (and don’t worry – we’ve got a military-style plan to get enough beer over there for the session). We’re also bringing it forward in the weekend. Watch this space. The wonderful all-age family band from Scotland will be with us again, leading sing-along sessions of their homegrown repertoire of all age children’s and family-friendly songs about life, love, meaning and identity. The Wild Goose Resource Group will lead one of their ever-popular Big Sings. Meanwhile, out in the main campsite, close to the 24-Hour Cafe and the Campsite Hub, our Franciscan friends from Hilfield Friary will be offering hospitality and the ‘daily offices’ across the weekend. And this year they’ll be joined by folks from the Community of St Columba, complete with their funky teepee – aiming to connect with a younger Greenbelters across the weekend through the rhythms of their community witness. Plus, last but certainly not least, the Archbishop of Canterbury will be ‘in the house’ again this Greenbelt. For those of you around in 2016, you’ll remember Archbishop Justin cracking jokes with the children about hats as part of the communion service. Well, he’s back, once again to present the Michael Ramsey Theological Book prize – but to have some fun with us, too. Watch this space.